In the 2015 Canadian federal election campaign that wrapped up earlier this week, the Justin Trudeau led Liberals won a smashing 184-seat majority government. Perhaps what is most amazing about the Liberal victory is that the party started in third place in terms of both number of seats and in the polls when the campaign began in early August. Not only did the Liberals win a majority, the party won every single seat in Atlantic Canada and the most seats in Quebec, Ontario, Manitoba and B.C. The Liberals also grabbed both seats in the Yukon and North West Territories and the party even picked up four new seats in Alberta. In spite of coming from behind and ending close to a decade of Conservative government rule in Ottawa, no one is much surprised at the convincing Liberal victory. Unless, of course, you are NDP Leader Tom Mulcair, his inner circle, or a diehard NDP partisan. Going into this campaign, everyone knew Stephen Harper and the Conservatives would be in tight to win a fourth mandate. The Harper government was lucky enough to win two minority governments, let alone a majority government, and time was running out on the most right wing government in Canadian history. Stephen Harper had managed to stay in government by abusing the powers of office, seeking to divide Canadians on various wedge issues to his advantage and moving about 30 per cent of the electorate over to his neoconservative values. Nevertheless, the other 70 per cent of the electorate had become tired of the Conservatives partisan games, racism, divisiveness, secretiveness, lies and war mongering. In short, there was a sizeable anti-Harper coalition in the electorate when the campaign began and it would be looking to place its vote with either the Liberals or NDP. And, when the campaign began, the NDP had a slight lead in the polls over the other two parties for a couple of reasons. Thomas Mulcair had performed well in the House of Commons hammering the Harper government on such issues as the Mike Duffy Senate scandal. In contrast, Justin Trudeau was often not in the House and when he was the Liberal Leader was ineffective. The NDP also took a very principled stand against the Harper government’s flawed and highly undemocratic Bill C-51 anti-terrorism legislation while for some strange reason Trudeau decided to support it. The new Liberal Leader had made other gaffes too, such as deciding one day that all Liberal appointed senators would from here on in be non-partisan and independent. No one believed this and particularly not the Liberal appointed senators. At other times, Trudeau looked shaky and nervous with the media. Maybe he was “just not ready” after all. At the beginning of this campaign the NDP had an opportunity to win the election and form its first federal government. But that’s all it was, an opportunity, not a sure thing. However, it is clear that Mulcair and his inner circle viewed winning the election as a sure thing as long as the NDP didn’t commit any major gaffes on the campaign trail. So the strategy was to play it safe and conduct a front runner campaign, limit media access, say as little as possible, run on a center-right platform so as not to “scare” anyone and take it for granted their base would support the party no matter what. Over the course of the eleven-week election campaign, voters would naturally see how much more prime ministerial Tom Mulcair was than Justin Trudeau and the anti-Harper coalition would automatically unite behind the NDP on election day pushing the party through to victory. And this is precisely how Mulcair and company proceeded to blow the best chance the Federal NDP has ever had to form government. If the NDP were going to have a chance at winning the election, the party needed to be bold not cautious, to stake out its ground on issues of historical advantage such as innovative social programming and to convince voters they would be a good government. Running the front-runner campaign always becomes the losing campaign because it allows your opponents to paint you to their benefit and makes voters suspicious that you are trying to hide something by being evasive. All votes must be earned and not taken for granted. Assuming that your base is not fluid and will always stick behind you is also a mistake. These are the types of bad decisions that happen when arrogance rules the day and there was no shortage of hubris in the 2015 NDP election strategy. From day one, the NDP ran a poor campaign. This started with Mulcair refusing to take any media questions at the NDP campaign launch. Why would the party do this? Mulcair’s handlers were clearly taking a page out of the Harper playbook of limiting media access. Yet Harper is the guy you are trying to beat and that everyone is tired of. Why emulate the Conservatives? In particular, reporters find it extremely annoying when a party is trying to act like it has already won the election when it hasn’t. It is the height of arrogance. The NDP continued to limit media access throughout the campaign. Media scrums were often cut short and sometimes Mulcair didn’t take any questions at all. Then it came out that the NDP Leader dodged Globe and Mail reporter Jeffrey Simpson for as many as eight weeks for a profile piece he was trying to do. In the end, Simpson got so frustrated that he wrote the piece without interviewing Mulcair. It has since come out that the NDP tried to contact Simpson at the last minute to set up an interview and he refused saying it was too close to deadline and the story was done. Ethically, Simpson should have conducted the interview and added Mulcair’s comments into the story. However, there is no doubt he was thoroughly annoyed at these arrogant twits around Mulcair dodging him for two months and had had enough. The point is, why was the NDP, of all times, going out of its way to alienate reporters in the middle of an election campaign? Remember, respect and trust has to be earned. The second major mistake the NDP campaign made was choosing to work against the party leader’s attributes and not with them. Thomas Mulcair is an attack dog politician. This is who he is and the type of politician he has been all his life. It is what has brought him success. However, because the NDP wizards that spend 90 per cent of their time on the Hill heard that a few reporters in the press gallery found Mulcair a bit too acerbic when he dealt with the media, all of a sudden “Angry Tom” had to go. Hence the bearded teddy bear appeared on the campaign trail flashing wooden and fake smiles at the cameras every opportunity he got. The phoniness of it all was painful to watch and you actually felt sorry for Mulcair that his handlers were forcing him to keep up this idiocy. The media saw through it and voters did too. The only people who didn’t see through it were his handlers because they kept getting him to do it. The third and most fatal mistake the Mulcair team made in the campaign was the “we will balance every single budget, come hell or high water, boom time or recession” pledge. Obviously the Liberal strategists had been doing some research on the issue of balanced budgets and were more aware of the current reality -- as opposed to the dunderheads around the NDP leader. First, Canada has a very healthy debt to GDP ratio so selling bonds at reasonable interest rates is not a problem. This, of course, was not the case in the early 1990’s. Second, world interest rates are at record lows so running reasonable deficits is not costly or harmful to the long-term health of the economy. Third, Canada has very good economic growth forecasts. Fourth, someone may have wanted to remind the NDP that the previous Conservative government had just run seven consecutive deficits and no one batted an eye. The Liberal campaign strategists knew all of this very well and also knew the economy needed some stimulus and infrastructure investment. Hence, they pledged to run a few deficits if elected to fund an infrastructure program before balancing the budget by the end of the first term. At this point, in late August, the NDP campaign strategists should have taken a deep breath and seriously thought about how they would respond to the Liberal's deficit pledge. The most prudent response would have been to emphasize that the two most important things the party wanted to do was bring in an affordable childcare program and a universal pharmacare program. If this meant running a few deficits, so be it. At the same time, even if the NDP ran a few deficits, the party could have said it was confident it could balance the budget by the end of the term while keeping these as the key priorities. However, as we all know, this is not what happened. In the NDP’s obsession to outflank the Liberals on the right, the party’s response to the Liberal deficit pledge was, again, that it would balance each and every budget if elected to office. And there is no doubt Mulcair’s team made this pledge before they had costed the platform. So from here on in, Mulcair struggled to answer how he would balance budgets without significantly raising taxes or scrapping the party’s social program pledges. And, not surprisingly, he never really had an answer. And soon key social programs like affordable childcare and universal pharmacare began to fall by the way side. If it was the difference between balancing the budget or not, these social programs would not happen until the end of the first term. Or maybe the end of the second term. Or maybe not at all. Mulcair and the NDP strategists began doing lots of whining about how Tommy Douglas balanced all budgets when he was Saskatchewan premier and they were just following his lead. The only thing they forgot to mention is that Tommy Douglas never ran a campaign with the key focus being balancing budgets. If he had, the CCF would have never been elected in Saskatchewan. Douglas won elections by promising to bring in public auto insurance, rural electrification, a trade union act, a human rights act, preventing farm foreclosures and many other social programs – all of which the CCF delivered on in short order. Sure, Medicare was not implemented until 1962 but this was after a lot of other things had already been accomplished. The key point is Mulcair’s team forgot the wise and important adage that political parties need to fight campaigns on their own ground in order to be successful. The NDP’s ground is innovative social programming. This is the area where the party has thrived and gained the respect of Canadians. Fiscal prudence is the ground of the Conservatives and Liberals but never the NDP. Provincial NDP governments have been very good at managing finances but nobody cares and the party will never get credit for it. Just like the Conservatives will never get credit for innovations in Medicare. This is not their ground; it is the NDP’s ground. Once the NDP was fighting the campaign on fiscal prudence and balancing budgets, they were losing and the party never recovered. It was the turning point of the campaign and why the party slid so badly in the polls in Ontario after the pledge. After this, the media and most of the public stopped taking Mulcair’s NDP seriously. They were no longer credible. And the anti-Harper coalition began to coalesce around Trudeau and the Liberals who were running a very solid retail campaign. From here on in it was a two party fight between the Liberals and the Conservatives and the NDP was assured third place. In other words, Mulcair was dead in the water by the end of August and the polls showed this as the Liberals continued to gain momentum. Liberal momentum continued to grow in all provinces before really taking effect in the last two weeks of the campaign as the anti-Harper coalition stampeded over to the party. Knowing they were in trouble and that efforts to make the ballot question about the Harper government’s good management of the economy (false, of course) had failed, in a last and desperate move to hold on to power the Conservatives tried to shift the election to divisive issues such the niqab, reluctance to take in Syrian refugees and the "barbaric practices" tip line. None of this had any effect on the NDP campaign. The NDP was already out of it and all but irrelevant. What it did do is shore up some of Harper’s base but at the same time it ensured even more voters were going to come out and vote Liberal to oust the government. There are a good number of NDP apologists who fail to realize all the mistakes the party made in the campaign prior to when niqab became an issue and who say Mulcair’s principled stand on the issue was why the party lost so many seats in Quebec. This is utter nonsense. Those voters for whom the niqab was a serious issue voted for both the Bloc Quebecois and Conservatives and both parties saw some very minor gains. However, the real story in Quebec, as in the rest of the country, was the tremendous growth of the Liberals. As in all other parts of the country, by late September, the anti-Harper coalition in Quebec had lined up solidly behind the Liberals and abandoned the NDP. They did this in spite of past misgivings about the Trudeau name and the Liberal sponsorship scandal. The key issue in Quebec, as most other parts of the country, was ousting Harper and voters in this province were no different than those in other provinces in realizing the NDP was “just not ready.” And for NDP apologists to say the sole reason the NDP lost seats in Quebec was because of Mulcair’s stance on the niqab is a joke. In particular because Trudeau came out harder against the Harper government on the niqab than did Mulcair. We are now closing in on a week since the Liberal election victory and not surprisingly the other parties are already moving on. Stephen Harper has stepped down as Conservative leader and the party is making plans to choose an interim leader and then organize a leadership convention. A number of Conservative MPs, past and present, are speaking frankly that the party had become too negative under Harper and it needs to change if the Conservatives are to expand their base. Gilles Duceppe has also stepped down as Bloc Quebecois Leader as this party looks to rebuild, if that is even possible. It is business as usual in the Green Party and don’t expect much to change there as Elizabeth May is more than happy to have the party be largely irrelevant as long as she continues to get some media attention. However, talking about the main parties, it is only in the NDP where there is no indication of a change in course. As was the case during the campaign, those in the inner circle continue to blame everyone else for the party’s failures. When the NDP campaign began to crumble, they first blamed the mainstream media for giving overly favourable coverage to Trudeau. When each and every polling company showed big time momentum for the Liberals compared to an epic slide for the NDP, they screamed all the pollsters were wrong and the NDP was much stronger than indicated. And, when the NDP got solidly thumped on election day, the partisans now blame the voters for being naive and being duped by the Liberals as some sort of alternative to the Conservatives when the NDP is the only “real” alternative. This again is, of course, nonsense as the NDP very happily ran a campaign to the right of the Liberals and the Justin Trudeau Liberals are very different from the Stephen Harper Conservatives. For those in the NDP, the bottom line is never to look in the mirror even in times of total failure. And perhaps what is most alarming is that Thomas Mulcair is now musing about staying on as party leader for an indefinite period of time. Why? Because his superior oratory skills in Parliament are supposedly needed to hold the new Liberal government to account. The same skills that gained the NDP absolutely zero on the campaign trail. Does anyone really believe that none of the remaining MPs could step in and perform the role of a third party leader on an interim basis? The NDP just ran one of the most disastrous campaigns in Canadian history. Dropping from first to third in polling and shedding 51 seats in the process. And, to those leading the party, it is as if none of it ever happened. 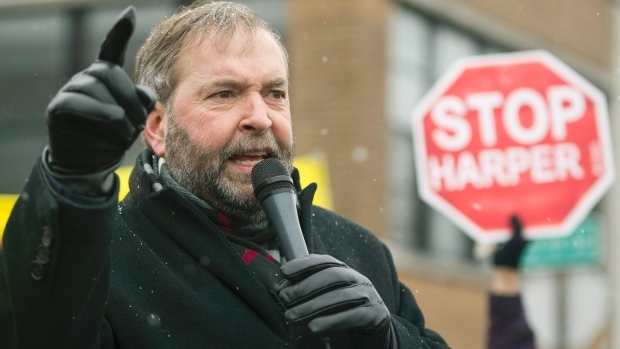 If Mulcair and his cronies won’t step down, the caucus should show them the door. But there are no indications at present that this will happen either. This likely says a lot about the weakness of current NDP elected representatives. In either the Conservatives or Liberals, such incompetence, ineptitude and failure would not be tolerated. But not in the NDP, where delusion always seems to rule the day. Fraser Needham is a freelance journalist living in Saskatoon, Saskatchewan. He has been working and writing in Saskatchewan for the past 15 years. Aside from the Saskatchewan CCF/NDP, he follows Aboriginal issues and politics closely. Do you have a left point-of-view or opinion, a recipe or a story you want to share? Send them to The Left Chapter via theleftchapter@outlook.com! Super excellent piece. Thank you. I have been making some of the same comments about the NDP's unwillingness to put this loss at their own feet and instead blaming the "duped electorate" who, apparently, blindly chose the Liberals to defeat Harper rather than any notion that it could have been that the electorate actually just did not like what the NDP was selling as much. The idea that Mulcair just blithely stays on is, as you indicate, perplexing. I agree with a lot what David said except his take on the balanced budget. He spouts the conventional myths and wanted the NDP to jump on board with them. I agree that was the turning point in the campaign but it was because the inner circle are out of touch with the grassroots of the party and ignored advice from us at the time. What David fails to realize and most voters is that even balanced budgets transfer enormous amount so of tax dollars to the wealthy as interest on the debt and that was not the case before Trudeau Sr. Debt service charges is the third highest expenditure in the budget after seniors and health care and is higher than defense. In this article David buys into the banksters spin that the debt is a low percentage of the GDP. What nonsense. Pure obfuscation. See my articles about this at . So this blog censors replies and won't publish a link to someone else's article refuting a portion of what is here. Google COMER -- Committee On Monetary and Economic Reform to find what was censored in my first post. Actually, I have the settings set so that comments are not moderated in advance. I moderate them myself later if necessary. Just for the record, I allow all comments unless they are personally insulting, racist, sexist, homophobic or possible libelous, so I did not, in this case, block the comment.
" It is business as usual in the Green Party and don’t expect much to change there as Elizabeth May is more than happy to have the party be largely irrelevant as long as she continues to get some media attention." What do you mean by this throw away line? This was a solid analysis. I agree - and I am am hoping to get Nathan Cullen to finally say why the NDP refused to issue a statement on the Bank of Canada Federal Court action being argued by Rocco Galati. There is something very unbecoming about this - that has shades of stalking horse behaviour for Power Corp. I will be watching for the NDP membership to take things in hand at the next NDP convention which automatically has a leadership review vote. Mind you I am not very optimistic given what the members did to the party's constitution, getting rid of any reference to its socialist roots. I was not really aware that the NDP had been so cool to media during the campaign - no wonder media was so cool to the party by mid-campaign. That can't happen Denis because NDP conventions are essentially run by the leadership. I have seen it firsthand - nothing comes to the floor of an NDP convention that the leadership doesn't want there (at least in recent years). For this party to use the epithet "Democratic" in its name is deeply ironic. A handful of hopeless people like Anne McGrath and Brad Lavigne have a stranglehold on the NDP and they are running it right into the ground. Many a progressive political movement has been crippled by caution and the mediocrity of its back-room sycophants. The author, in his extremely passive writing style, focuses on his feelings rather than fact. I am certainly no fan of Tom Mulcair, but to suggest this was worst campaign in history shows that the author has no knowledge of Canadian history. The PC campaign of 1993, the CA campaign of 2000, the Liberal campaign of 1984 all displayed far greater collapses in popular vote. Lest the author forget, this is the second most seats the NDP has even received in a general election. Delusion - ha. It is apparent - in the form of an author who displays propaganda pics from the Supreme Soviet circa 1935 on his blog. Enjoy you Stalinism Fraser. I'm sure you'd make a great Stakhohnov. I think you are right to a degree. But the simple fact is that as the author may be focusing on "feelings rather than fact" so do many people do the same in politics in general. And I think that the author is correct that the rhetoric of "balanced budget" discourse, simply alienated many people (particularly in Quebec) who were going to vote NDP. And I believe that the author is also correct when he says that if the NDP had not made this emphasis on balancing the budget and instead emphasized their progressive policies and then said, we will balance the budget after a few years after this progressive agenda is in place, then things would have been very different. Your criticism has some truth to it. But I'd suggest that, in the broader picture, the policies you mention ended up as just one participating factor in a campaign that came across as incoherent /and/ insincere (quite an accomplishment). Proposing these fairly substantial policies, while at the same time talking about balanced budgets, no tax rises and middle-class-this middle-class-that, simply /amplified/ the perception created by 1) a party trying to control its message instead of connect with the public, and 2) a leader who seemed to be pretending to be someone else. Thanks for the analysis and good to see debate and sharing of how the ndp works, for sure. It seems all the parties have their control/strangle hold people, sadly I see this with numerous organizations. I never felt deluded with wanting to have a government of the people. In fact, I knew the NDP had developed weaknesses. All I wanted to do was stop Harper and create a country where equality was still important. My delusion lay in the fact that other Canadians wanted it too. I was wrong. Canadians want the status quo. That is why I no longer want to be one. I'm 66 and have been paying attention to politics for half my life. I'm moving on now and hope all the best for you remaking ones. Thanks for listening. In large part this analysis of the NDP defeat matches my own, with the exception of one element which I believe to have been more significant than many seem to be willing to consider. That being the joining with Harper in not dong the Consortium debates last May and continuing that position at the beginning of the election when Mulcair pulled out of the women's debate he had a year earlier promised to attend and had many times made a big point about attending. I see that as what neutralized the C51 hit on Trudeau with many of the progressive anti-Harper voters on the democratic defender argument, especially since when you get right down to it an empty vote on bad legislation from a majority government for political expediency reasons is one thing, while making a decision which directly and negatively affects a national election campaign is quite another. This is important because it took the defenders of democracy mantle away from Mulcair and the NDP, especially when the party lined right up on this decision and used the logic they did to defend it. Only need to debate Harper because it was Harper they were interested in defeating. If any prior LOO had used that line to side with a PM doing the same while the NDP were the third party of Parliament they would have SHRIEKED in anger and outrage about how anti-democratic this was, how this was active collusion to prevent other voices from being heard nationally, and they would have been RIGHT to do so. Yet the party and its partisans seemed oblivious to this and defended this decision without blinking. I see this as being the first heavy blow to a what appeared to be solid ice sheet that the NDP support was standing on placing many deep cracks throughout it but since they were below the surface not noticed at the time. Then came the economic update, the costing roll-out which was clearly poorly managed and using clearly out-of-date and wildly overly optimistic CPC budget figuresto rely on, the decision to be deficit hawks, and the Trudeau's infrastructure deficit spending, which combined was the second heavy blow to this ice, and when that force hit it caused those underlying cracks to complete into fractures which broke up that once solid surface and sent that NDP support sinking under its own weight on ground that no longer gave them any purchase. I would also add that the withdrawal from the Women's issues debate specifically caused problems because of the Harper wouldn't be there argument, since that by this time was the position in general had a hollow ring I suspect for many who were interested in that debate. I know I was interested in it, and I also knew I never believed Harper would be caught dead at such a debate given his record on women's issues and his contempt for that part of the voting public. The womens vote he was interested in was not those that would be following that debate, no he was more interested in those like that had made up REAL Women in the past. Mulcair had to have understood that when he agreed to this debate last year, as should any progressive or centrist political actor, and that made his excuse for not attending after all have a particularly hollow and expediency driven vibe to it, which when you are trying to argue you are the only leader and party that does not make decisions on such grounds is NOT a wise move. I honestly found the debate gambit by Mulcair baffling from the outset. What LOO regardless of party lets a PM with the record of Harper get away with that without denouncing him to the highest for it, and does everything he can to try and force him back to the Consortium debates? He could (and I say should) have told Harper something like "I am fine with additional debates so long as you agree to the Consortium debates, but since they reach the most voters by a much greater degree than any other debate can we must all be present for that one or else I will not debate you anywhere and debate your empty chair at the Consortium debate." Yet Mulcair didn't wait 48 hrs last May to take the position he did instead, letting Harper off that hook. I really think that decision was the true beginning of the end for the NDP in this election campaign, and the true beginning of the return of Trudeau as the anti-Harper vehicle. Of course the rest of the elements you raise in this post of yours also come into play, but I think this is where it truly started, and I think this is being missed by many even among those willing to see he flaws in the campaign itself. Overall though this is one of the best analyses of the NDP defeat I've seen yet, pity you are clearly in the minority about it within NDP circles so far. The NDP needs to take a cold hard look at what really happened if it is to have any real chance at becoming effective again anytime soon, and while I am not an NDPer myself I have always in the past valued having a strong NDP voice as part of our political dynamic, right until Layton decided to sell out to Harper in the hopes of killing off the Libs and replacing them for government. I would love it if the party finally understood what it had done there and rediscovered their roots, this national badly needs a true progressive voice to go against the clearly more extreme CPC right wing that is developing and the broader centrists the Liberals have become. Vena's Roti on Bloor St. -- "Best Roti in Town"